Without the benefit of modern technology and medicine, did the early Morgan breeders look for a way to produce horses that could remain physically, mentally, and reproductively sound throughout an unusually extended lifetime? And if they did achieve this remarkable feat, how did they do it, and have any of such Morgans survived into modern times? In general terms, the lives and life spans of today’s horses have vastly improved due to better overall care and advances in veterinary science. The average lifespan for a horse today is at its all-time high and is somewhere between 20 and 25 years, with a few individuals reaching or surpassing 30. Today, the Morgan tends to live longer than the average horse. But what if you wanted a Morgan that could seemingly defy the effects of old age; a horse whose youthful outward appearance and physical health could remain remarkably intact throughout an excessively long lifetime, and without any scientific or human intervention? In short, what if you wanted a trouble-free horse that could almost remain forever young? Our journey to find such a horse takes us to the village of Hillsboro, West Virginia, and to a farm that is home to a rare and unique family of Morgans, a group of horses who appear to age in slow motion. The farm is named The Quietude Stud and the horses who reside there are the closely bred descendants of Daniel Lambert, a horse, who in his time, was considered to be without equal. Daniel Lambert lived a long life, even by today’s standards. He died in 1889 at age 31 in an era when a horse half his age was considered to be quite old. His sheer physical beauty and trotting speed were legendary, and remarkably, neither his beauty nor vigor faded with the passage of time. It was said that Daniel Lambert never seemed to grow old. The Quietude Stud’s owners are Susan and Shannon Hanley, who established their breeding program more than 30 years ago. They now have just over 70 horses grazing in their pastures, all of them Clean-Blooded Lamberts. They do little advertising and do not show their horses, yet they have a substantial following and easily sell the 8 to 12 foals they produce each year, many times to enthusiastic repeat buyers. Their indifference to the changing fashions in the Morgan show ring has led them exactly where they always intended to go. They have stayed the course, breeding their Lambert Morgans to the same exacting standards, with the same philosophies, and from the same original bloodstock as their horse’s ancestors were previously bred; for 40 years by a woman named Frances Bryant, and before that, for more than 40 years, by a gentleman named J. C. Brunk. The Brunk stock always was well known for their ability to live long lives. In fact, Brunk’s oldest mare, Lucy, was said to have lived to the astonishing age of 42. Usually when a breeder disperses a herd, the breeding philosophy goes with it, and in a few generations, the original stock is almost unrecognizable. But in this case, when the torch was passed from Brunk to Bryant to Hanley, it was passed intact with the fire still burning. The Quietude herd is closed; that is, there will be no new introduction of outside blood to thus preserve the characteristics and identity of the family. The breeding “recipe” that was first developed by J. C. Brunk and later perpetuated by Frances Bryant is still practiced in the same way today at Quietude, and the horses that have resulted from it are nothing short of exceptional. And when the Hanleys say their horses live long and productive lives, they are not kidding. Take for example two of their older broodmares, Comfort Of Quietude (Criterion x Aurelia Ashmore) and Criteria Of Quietude (Criterion x Dolly Ashmore). In 2003, comfort produced her thirteeeth foal, a beautiful flaxen filly sired by Crispin Of Quietude (Criterion x Royalton Drucilla D), and Criteria produced her eleventh a handsome chestnut colt sired by Courage Of Quietude (Criterion x Towne-Ayre Gay Cindy). Why is this remarkable? Because both mares turned 26 in 2004, and Crispin and Courage both turned 25. Although a group of veterinarians might be rightly impressed with their breeding statistics, having geriatric horses in reproductive vigor is nothing unusual for the Hanleys. Caress Of Quietude (Criterion x Caven-Glo Ballerina) and Critique Of Quietude (Criterion x Dolly Ashmore) are 23-year-old broodmares who also produced healthy foals in 2004. Critique will produce another foal this year, but Caress was intentionally given a year off from motherhood, as she is also a popular saddle horse with friends and visitors to the farm. The 22-year-old stallion Calcutta Of Quietude (Criterion x Dolly Ashmore) is still going strong, as is his half brother Chariot Of Quietude (Criterion x Dulcimer of Quietude), who is a youthful 20. Seven Lambert mares over the age of 20 reside at the Hanleys’ farm. The senior citizen Morgans share a genetic common denominator through their sire, Criterion (Jubilee’s Courage x Lippitt Robrita), a grandson of Jubilee King. He was the blueprint for the modern family known as the Clean Blooded Lambert as well as the foundation sire for The Quietude Stud. And just like his offspring, no one would have believed he was 34 when he passed away, save for a few white hairs on his face. He too moved and looked like a prime-time athlete, and always remained physically and reproductively sound. Aside from imposing physical beauty, the real display of Criterion’s natural ability became apparent when he went into motion. His powerful suspension and tremendous natural impulsion made him appear as though he were floating over the top of the ground. The ability to achieve this distinctive trot is a trait of the Lambert family that consistently occurs in both genders, and is an indicator of structural excellence as well as a predictor of sustainable soundness. It was first made famous by Criterion’s ancestors; by Sherman’s son, Black Hawk; by Black Hawk’s son Ethan Allen 50; and by Ethan Allen 50’s son, Daniel Lambert. This was the gait and form of original Morgan trotters and can easily be recognized in the stylized horse trotting atop weathervanes. When we gaze upward at the familiar trotting horse weathervane, we are likely gazing at the image of Sherman’s son, Black Hawk, grandsire of Daniel Lambert. The Lamberts of today give us a glimpse into the past, at the sort of living Morgan that inspired an artist to depict a trotting horse that is forever flying weightless though the air, forever married with the wind. The powerful, floating movement, in combination with a substantial and powerful form, was intended to produce an equine athlete that could remain sound indefinitely while performing physically and technically challenging work. This was the goal of the ancient Morgan breeders and later the goal of Brunk and Bryant, and continues to be the goal of the Hanleys breeding program today. Veterinarians agree on one point about the aging process in equines and that is the rate of aging is determined mostly by nature (genetics) and to a lesser degree by nurture (management practices). Since DNA plays such an important role, understanding the ancestry of the ancient Lamberts might help to explain the physical staying power of the Lambert Morgans of today. Never was a horse more perfectly named than Criterion; the name not only defined the horse, but it also defined the horse’s destiny. Criterion was and continues to be the standard for the Clean-Blooded Lambert family. He was bred by Frances Bryant, who chose him to succeed his sire, Jubilee’s Courage, as the breeding stallion at her Meeting Waters Farm in Vermont. Criterion’s grandsire, Jubilee King, gave him six of the nine close crosses he carried to Daniel Lambert. The other three crosses came from his dam, the Woodbury mare, Lippitt Robrita. When Mrs. Bryant retired from breeding, the Hanleys convinced her to sell them the then 12-year-old Criterion. Then they located and purchased as much of Mrs. Bryant’s previously dispersed breeding stock as they could find, literally reconstituting her breeding program. Frances Bryant was the last owner of Jubilee King and once wrote of him, “Roy Brunk’s father said when King was foaled that he was the one who would have a great influence on the breed. How true that was. I was fortunate to own him that part of his life.” Before settling in Vermont, Jubilee King had lived a hard life, but nonetheless lived to be 29 years of age. Like all Morgans, Criterion carried the blood of the ancient Woodbury family, but in appearance, he was clearly a Sherman, right down to his color and markings. In fact, he was probably one of the strongest-bred Shermans in the breed. Criterion was cut from the same cloth as his grandsire Jubilee King, and the physical resemblance between the two horses was striking. 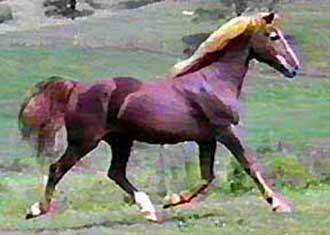 Criterion had a full sister, Cathy Serenity, who when out-crossed to the Government stallion Bennfield produced the world champions Bennfield’s Ace and Katy Bennfield. By close breeding to Criterion, the Quietude horses are, from generation to generation, male or female, uniform and consistent in appearance and movement, and very striking. They have incredible bone and substance, but are not coarse, with a lot of original Morgan type. Symmetry and structure aside, their color alone draws attention. Unlike many Morgans today, bays in this family are the exception and not the rule. 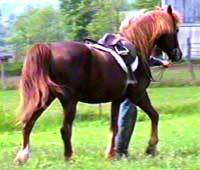 Here, bright chestnut coats with flashy white markings on the legs and face combine with long and flowing manes and tails that are likely to be flaxen or even white. And their dispositions may be the best family trait of all. Their temperaments are often called “golden.” This is the kind of horse that is safe enough for a child or a grandparent, yet game enough to be a real contender in the sport-type disciplines and always ready, willing, and able to be a friend for life. Not surprisingly, people frequently own these horses for a lifetime. Within the Morgan breed, there are two families that exist under the same umbrella: the Lamberts and Lippitts, both considered “high percentage” families. The term “high percentage” is a reference to a high concentration of Justin Morgan’s blood. The Lamberts are considered to be a high-percentage Sherman family, while the Lippitts are considered to be a high-percentage Woodbury family. Unlike the other Morgan families, Lamberts and Lippitts are narrowly defined, the definitions being based on specific hereditary criteria, which exclude horses with modern outcrosses to other breeds. While both definitions are exclusionary (to best preserve these high-percentage families), there are nevertheless many excellent Lippitts and Lamberts in the breed that do not meet the definition of either family, but are strong in the old Woodbury and Sherman blood. Daniel Lambert was a Sherman and he may well have been the best roadster ever produced. Daniel Lambert and his offspring were working athletes who had to prove their worth on a daily basis, often by winning impromptu harness road races. In form as well as function, the Lamberts were and continue to be a family of sport horses. Although the horses of Quietude are distinctly Sherman in appearance, structure, and movement, their Woodbury blood, originally used to widen the gene pool, has undoubtedly contributed much to their success as a family and to their classic Morgan type. In this context, it is probably fair to say that Hale’s Green Mountain Morgan was to the Woodbury line what Daniel Lambert was to the Sherman. And if Daniel Lambert was an early sport horse, then Hale’s Green Mountain Morgan was every bit as much an early show horse. In his day, Green Mountain Morgan was a show ring superstar whose Morgan type and beauty were so valued that even to this day, his image still appears at the top of the registration certificate as the official representative for the breed. His offspring were in great demand and sold for large sums, being valued for their type, stamina, beautiful heads, and good feet and legs. And most notably, Hale’s Green Mountain Morgan lived to be 30, in a time when most horses never lived beyond their teens. Arguably, Ethan Allen 2nd was the Lippitt family equivalent to Jubilee King and his Lambert family. And although the Lambert and Lippitt families are separate and distinct from one another in their history, their appearance, and even their predominant colors, they nevertheless share many common ancestors. In fact, neither the Lamberts nor the Lippitts would exist today had it not been for the blood they each contributed to one another. Ethan Allen 2nd and Hale’s Green Mountain Morgan are both rich in the pedigrees of the Lamberts, while Daniel Lambert is rich in the pedigrees of the Lippitts. Their shared heritage has strengthened and improved both families, yet both have managed to retain their individual identities and characteristics, even into modern times. Man has always been obsessed with the preservation of youth, beauty, fertility, and longevity, an obsession that likely will never end. And what we want for ourselves, we also want for our horses. But in our quest to find a high-tech magic bullet in our never-ending battle against time for our equine friends, we are perhaps, overlooking the obvious. We, the people of the twenty-first century, were not the first to go looking for the fountain of youth for a horse. The early Morgan breeders began the quest long ago, and did so out of necessity. Their horses worked hard, lived long, and did so with beauty and dignity. 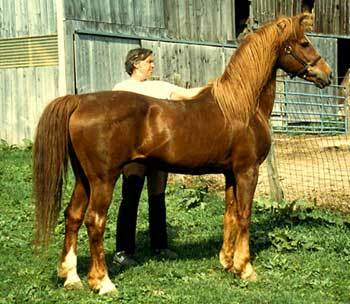 And there are still Morgan breeders around who breed that kind of horse, with the same genetic architecture. So if you consider 26-year healthy productive broodmares who don’t look a day over ten and 25-year-old stallions who can rival their own grandsons with their youthful good looks, (none of whom need any help from a human or science,) as being something pretty darn remarkable, then it is fair to say the Lambert Morgan breeders (both then and now) have achieved a striking degree of success. It must be true that beauty really does come from within…from within the double helix. If you are only hoping that some time in the distant future it may be possible to have a Morgan that can fool Father Time, well, think again. You need not wait; the future is now, just as it always has been. It resides in an ancient family of Morgans, the Lambert Morgans of the Quietude Stud. A family of beautiful horses with a special gift from their ancestors: the ability to seemingly remain, throughout a long and healthy lifetime, forever young.